The Tour de France is the biggest bike race on the planet. It is the most watched, most followed and most well known of all the bike races across all biking disciplines. It is the one race that even non-cycling fans have heard of. In fact for many people it is the only race they will watch or take any interest in all year. As such, these casual observers are often confused by what they are watching. But that’s okay. With the 2018 edition of the big race just a few short weeks away from starting, we thought we would produce the following guide to help ease the novice or occasional viewer into a fuller understanding of the great event. Let’s start with a brief statistical look at the structure of the 2018 edition. There will be 21 stages or days of racing. Eight of these will be over flat terrain, five over hilly terrain and six through properly torturous mountain terrain. There will be one individual time trial and one team time trail as well. 22 teams of eight riders each will take part, making 176 riders in total, and they will be covering 3,351 kilometres. But the statistics tell only part of the story. This is the big one, the one that all teams dream of winning. The winner of the general classification is the overall winner of the race. He is the one that gets from the starting line on day one to the finishing line on day 21 in the least amount of time. He also gets to wear the yellow jersey. 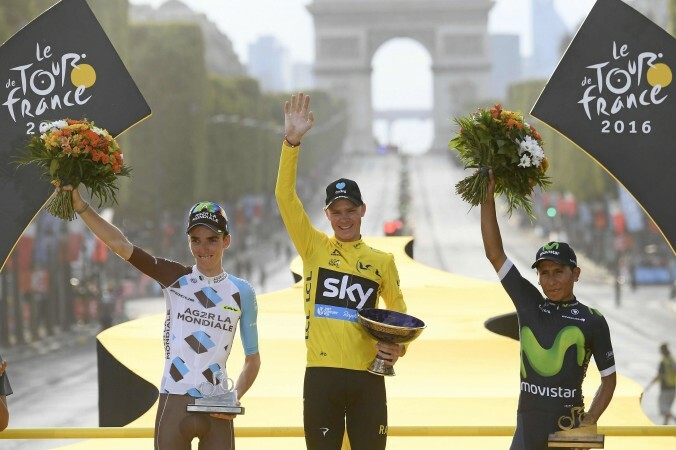 Although all teams dream of one day winning the general classification, very few of them have the capacity to do so. Out of the 22 teams competing, perhaps only five or six have genuine general classification chances. To win they must have an accomplished team leader who can climb, time trial and stay out of trouble. He must also be resilient and be able to back up his performance day after day after day. If a team feels that it has such a leader, it will build its squad around him, providing support riders called ‘domestiques’ who will shelter him from the wind, pace him through difficult moments and protect him from the chaos and carnage of the peloton. In short, these domestiques sacrifice their own chances of glory by devoting themselves to the service of their leader. So, I hear you ask, if only a handful of teams have a genuine chance at winning the general classification, why do the other teams even bother entering? Well, they have different objectives of course. Read on to find out more. Some teams have very fast, very powerful sprinters. These crazy individuals thrive on the flat stages where they conserve all their energy until the very last moments of the race. Then, and only then, do they try to burst clear of the pack and charge for the line at ridiculous speeds of 60 to 70 kilometres per hour. They are not concerned with time like their general classification brothers, but rather the accumulation of points and stage wins. A sliding scale of points is available for the first riders across the line at the end of each stage and the rider who has accumulated the most number of points after the 21 days of racing is awarded the points classification. This lucky rider gets to wear the green jersey. There are also intermediate sprint points placed at certain locations mid-stage, just to keep things interesting. Although a sprinter often wins multiple stages (indeed Mark Cavendish once won six in one edition) they will never feature at the top end of the general classification. This is because they are not interested in busting a gut in the mountains and as such lose great swathes of time every time the road kicks upward. This is like the points classification except that the points are awarded at the top of each classified climb. Be among the first riders to crest a mountain and you are in the points. This classification favours the climbers. A climber who may not have the all round capabilities to contest the general classification might target this prize and if he manages to pull it off, he gets to wear the highly fashionable polka-dot jersey. Often a general classification rider who has fallen out of contention for the overall prize will change his focus to becoming king of the mountains, although sometimes a general classification rider will be so dominant that he will pick up both prizes, the king of the mountains and the overall. Only riders under 26 years of age are eligible for the young rider classification. It follows the same conventions as the general classification, being based on elapsed time and not points. The winner of this prize gets a dazzling white jersey. Of course, if the young rider is good enough to win the general classification as well, then he receives both awards. So, as you can see, the Tour is more than just a race from point A to point B. On any particular day you will have riders targeting the stage win, riders chasing sprint points, riders chasing king of the mountain points, general classification riders protecting their overall position, young riders fighting out their own battles and also a doomed breakaway of a handful of riders seeking a bit of TV time for their sponsors. Being first across the line is not always the objective. More often than not, finishing safely within the group is the most important thing for the general classification riders, especially on the flat, nervous stages early in the Tour. Because the whole group gets the same time when they cross the line (there must be a break in the group before a time gap is given) they don’t have to be fighting it out with the sprinters at the front of the bunch. Also if a crash occurs in the last three kilometres of a stage where a bunch sprint is expected, the rider who crashes will get the same time as the group he was with before he crashed. The Tour is full of rules like that! The more you watch, the more you learn, so this July, grab some popcorn, sit back, and enjoy the ride. In part two of this article which will appear early next week we will look at the different types of stages that are to be raced this year and some of the team tactics that you can expect to see. See also: How Much Do Professional Cyclists Earn?